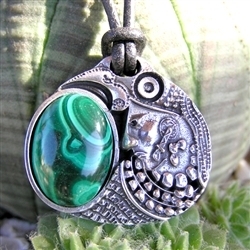 $225 Mayan warrior pendant with a 13.5 mm wide x 18.5 mm high Malachite cabochon. This pendant hangs on a black leather cord. The overall size of this piece is 30.5 mm wide x 29.5 mm high. Design Notes: The design of this pendant is taken from a Mayan stone carving of a warrior who was wearing a feather headdress in the shape of a raven.